Figure 1. A student from University of Alaska and a scientist from Germany work together to take measurements in Alaska. Figure 2. Research scientists and middle school students drill into the frozen ground in Alaska to measure soil temperature and moisture. Frozen ground affects climate, plants, animals, and people. Because frozen ground is so important, scientists study it carefully. However, scientists also study frozen ground simply because it is so interesting. Scientists use many different methods to study frozen ground. Do permafrost scientists do research outside? 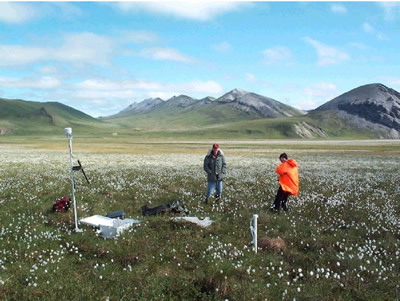 Scientists go out to areas of frozen ground to gather information on ground temperature, depth, and moisture (Figure 1). This information is useful to understanding how frozen ground forms and changes. For example, with this information, they can get a good idea of how permafrost is changing over time. Scientists monitor the thickness of the active layer of ground on top of the permafrost, the temperature, and the amount of ground water. Scientists working in the field drill holes and insert instruments to take measurements underground (Figure 2). Temperature and moisture sensors give information at various depths. However, drilling creates heat. Scientists use protected pipes and blow cold air into the drill hole. These efforts keep the ground from thawing and keep the measurements correct. Researchers try to disturb the ground as little as possible while they work. Scientists have set up monitoring sites across areas of permafrost in the Arctic. These sites collect data over many years. Some of the sites were established back in the 1840s. The long-term data help scientists understand the permafrost's history, as well as its possible future. Do scientists study frozen ground from space? Scientists need to understand frozen ground on regional or even global scales. Relying on field observations alone would be difficult. Scientists would have to cover huge regions that are very remote and spread out. However, satellites can provide frequent information over large areas (Figure 3). For example, some satellites go around the entire Earth several times every day. Satellite technology is complicated, and some scientists specialize in understanding satellite information. 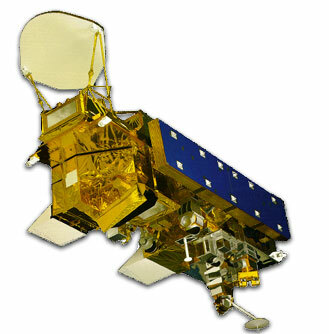 For example, today's satellites cannot look into the ground right at permafrost. Instead, scientists look for signs of landforms that only occur in frozen ground areas. When scientists see these landforms, they know that the ground is probably frozen there. Satellites can also tell scientists the surface temperature on the ground and whether water near the surface is frozen. Scientists verify the satellite information by comparing it to what they have learned in the field. Do permafrost scientists work in laboratories? Some scientists specialize in laboratory experiments on frozen ground. Indoors, scientists can control conditions and study the processes that happen when the ground freezes. For example, they can study how quickly water freezes in different soils. Can scientists predict what will happen to frozen ground? Scientists cannot predict the future with certainty, but some of their tools tell us what could happen in the future. This is a little bit like forecasting the weather. Weather forecasters use information about what is happening right now, and what has happened in the past under similar conditions. This information helps them predict what the weather may be like later in the week. Forecasting changes to permafrost works in a similar way. Scientists use computers to put information from field work, satellites, and the laboratory together. Experts can test ideas and see what might happen in the future. For example, they can explore what would happen to permafrost if the air temperature in Alaska were to rise by a few degrees. These forecasting efforts are called computer simulations or computer models. What is the newest area of frozen ground research? Frozen ground research is complicated. Scientists have been studying frozen ground for decades, but they still have much left to learn. Scientists build on the work of the experts who studied before them. However, they always want to improve their understanding of even the basics, like how and when frozen ground forms, where it is located, and the role it has on our planet. One of the newest areas of frozen ground research has to do with climate change. Scientists use a combination of field work, satellites, laboratory tests, and computer models to better understand how frozen ground has changed and may continue to change as our planet warms. Today's permafrost scientists are especially interested in how frozen ground and climate work together.